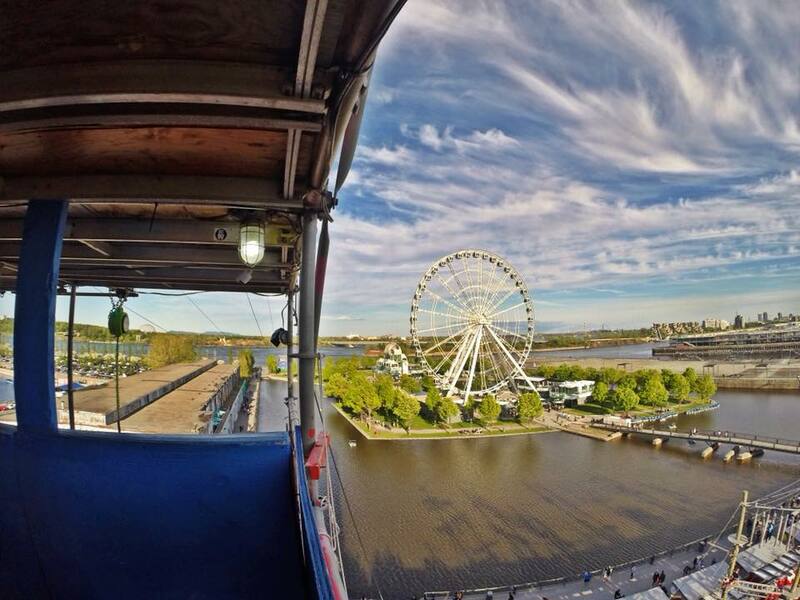 Since moving to Montreal, we’ve created quite an extensive Montreal bucket list for families including adventures, dining, museums, parks, and must-do experiences in Montreal, Quebec. 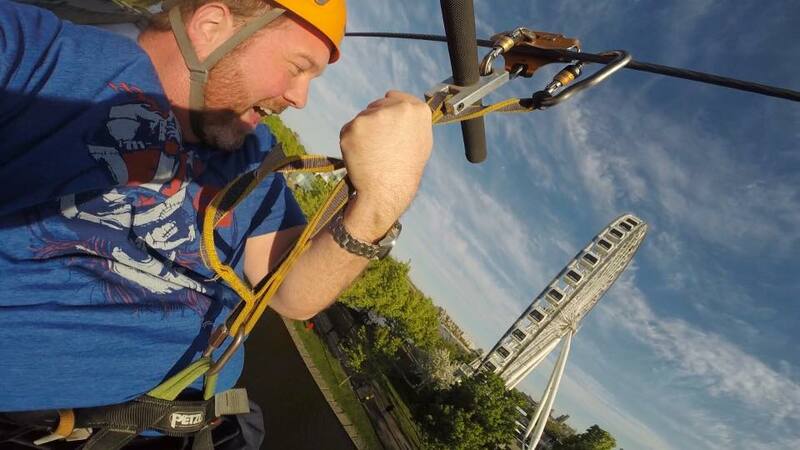 One adventure that should be at the top of your Montreal bucket list is flying like a superhero over Old Port, Montreal on a 1,200 foot zipline with MTL Zipline. 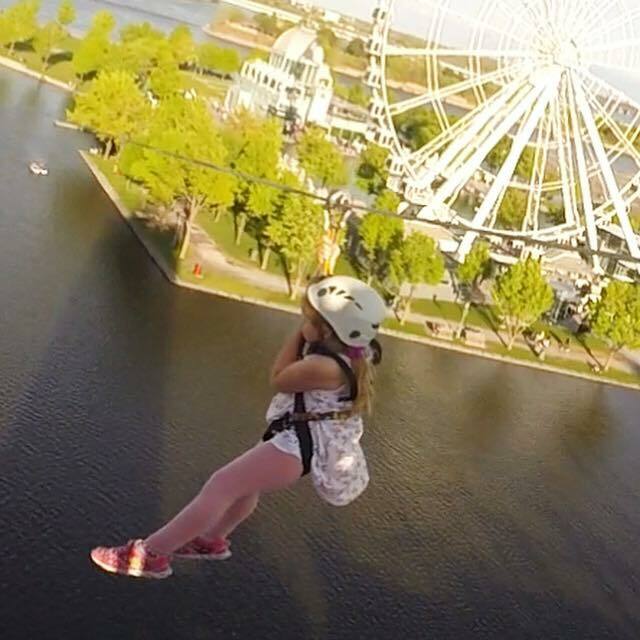 When I first saw the height of MTL Zipline, I didn’t think it was a completely family-friendly adventure but after watching Athena zip over the famous île Bonsecours with a smile on her face, I can attest to its family-friendly awesomeness. 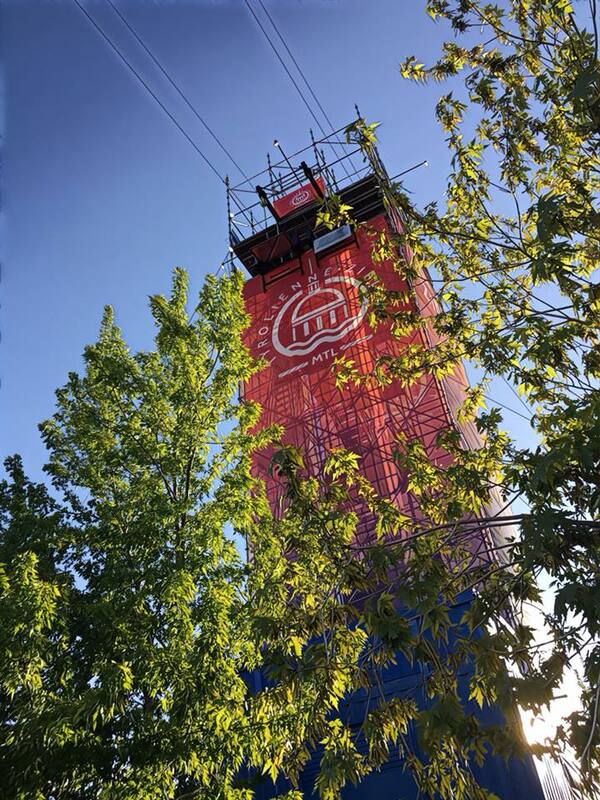 MTL Zipline is located next to the Clock Tower Dock in the Old Port of Montreal. They’re beside Hangar 16 and in Front of the Bonsecour Island. You can purchase your tickets onsite or buy in advance online for a few dollars cheaper. 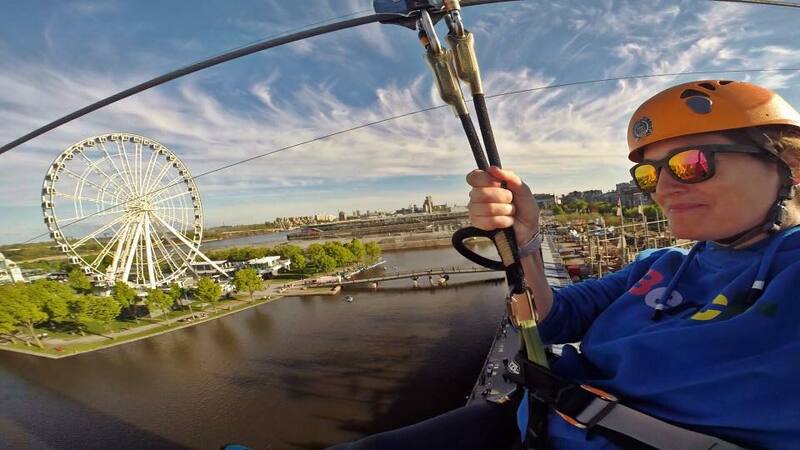 It’s only $20 and the entire experience takes about 15-20 minutes, but it’s a worthy thrill to get your adrenaline pumping while giving you lovely views of Old Port, Montreal. 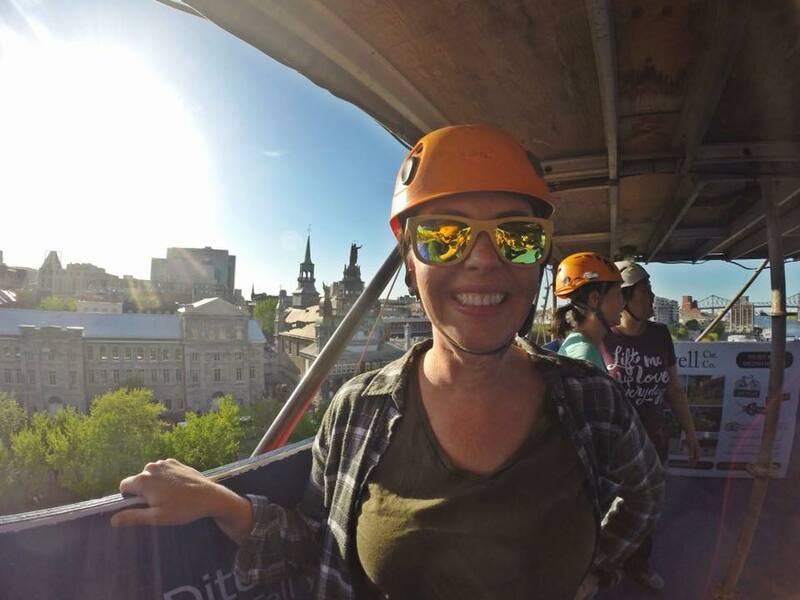 For a list of other great bucket list items in Montreal, check out Montreal Bucket List for Families. Consisting of two zip lines side by side, MTL Zipline gives you the opportunity to enjoy and share your experience with another person at the same time. We brought along our friends and enjoyed the adventure together. Admittedly, I didn’t think Athena would participate and I was 100% certain her friend, Lydia, wouldn’t participate. We’d gone rock climbing with Lydia before at Altitude Gym Gatineau and she had a panic attack on the wall, leading to an instructor eventually needed to push her off screaming. Her parents, Michael and Heather, joined us as well and they are both petrified of heights. I honestly had no idea how the event would unfold. It seemed likely that Cord and I would be ziplining on our own. I offered to go with Heather while the guys stayed on the ground with the kids. Then, the guys could go while the ladies stayed on the ground with the kids. I thought it would give us the most chances of all adults actually ziplining without chickening out. Heather and I put on our gear and headed up the endless stairs to the top of the zipline. The views were spectacular. 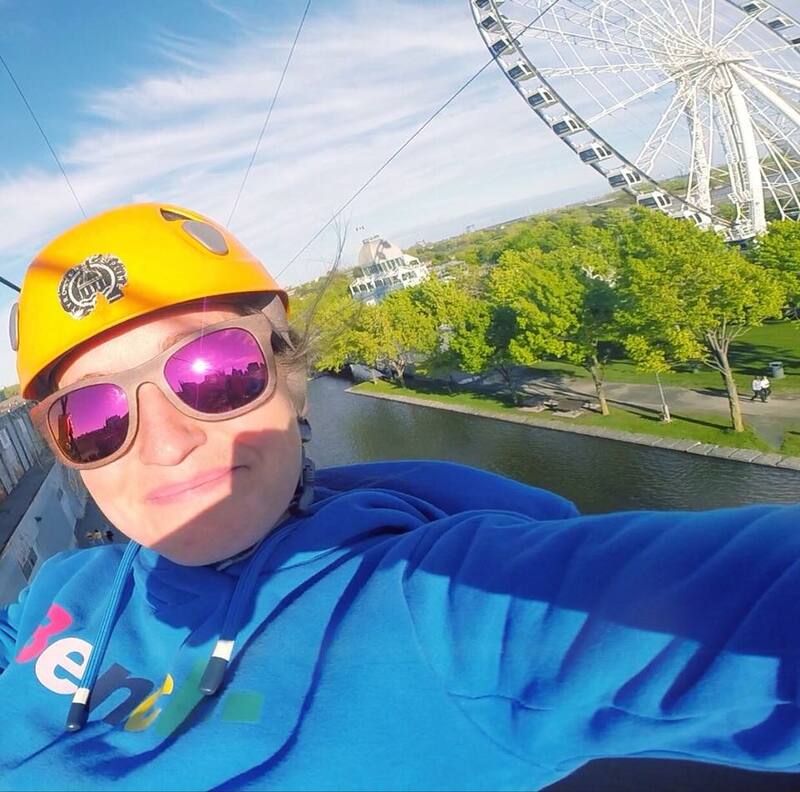 We were at the top of the zipline just as the sun was touching the rooftops in Montreal. It created stunning shadows and bright skies for our adventure. Heather was nervous. I made small talk and avoided pointing out the views or the heights. I asked to take photos as a distraction and although she was smiling I could see her nervous cues like gripping the wall and very little conversation. When we reached the end of the line, or the beginning of the zipline, Heather was clipped in first and I heard her ask the guy to push her off. He complied and she was gone before I could even take a photo of her. 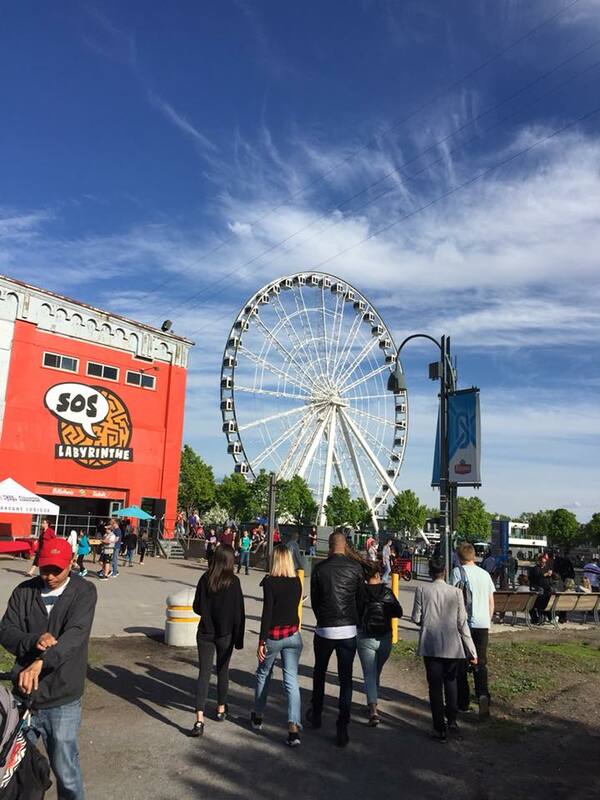 I was clipped in and raced after her, yelling with delight as I zipped by the Ferris Wheel. When we reached the end, Heather said she loved it. She was scared, but grateful that I’d convinced her to do it. She was giddy with adrenaline and already talking about what high flying adventures we could do next. It was time for the guys to give it a try. As we walked back to the entrance point, Athena and Lydia asked if they could go too. My philosophy with Athena is that if she asks and wants to try something that pushes her limits, in a safe way, than I’ll let her try. We never know what we’re capable of accomplishing if we don’t try or if we’re told, “no, you can’t do that”. So I asked Cord if they’d be ok with taking the girls and the four of them were off to climb the stairs. Athena was all smiles as she put on her harness and helmet. I don’t remember being so fearless as a child but my mother will tell you otherwise. When they reached the top, Athena was the first one off the platform and I could hear her screaming with excitement from the other side of the water. She screamed the entire way across the zipline. I had to laugh. If this is what she’s doing at six, imagine what she’s going to be doing at 16! One by one, Cord followed Athena, then Lydia went, and Michael ended our convoy of zipliners. It was beautiful to watch. 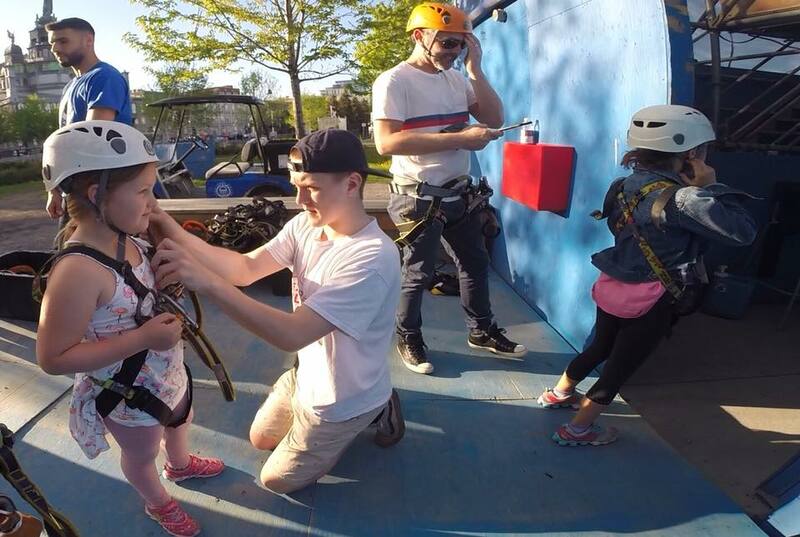 I originally thought MTL Zipline was more of a teen and adult activity but Athena and Lydia are proof that MTL Zipline is a wonderful adventure for the whole family. You gain strength, courage, and confidence every time you face your fears. Stay tuned for our next great Montreal adventure. There’s always more to come.